and 1-2 tablespoon of cold water. 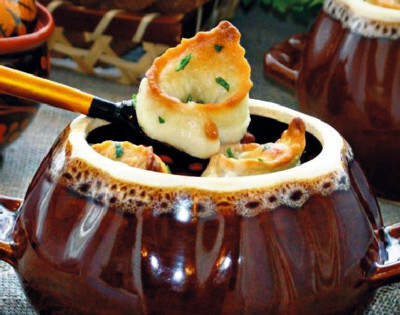 Kundyubki or kundyums or bear's ears it's a traditional old russian dish, it's dumplings with mushroom filling. However, from ordinary dumplings they differ not only in special filling. The dough for Bear's Ears is kneaded in vegetable oil (poppy or sunflower) and hot water and is a combination of extract and brew dough. The filling is prepared from both fresh and dried mushrooms and can be combined with rice or buckwheat. And finally, the main difference from ordinary dumplings is that Kundyubki do not boil and at the beginning they are baked and then is cooked in the oven. Stew mushrooms for 15-20 minutes in saucepan with tightly fitting lid. Then chop finely and fry in butter and sour cream with boiled rice. Roll out dough in a thin layer and cut in squares. Put a little filling on each square and pinch the edges together to form a triangle. Then pinch together the ends of the long side of the triangle to make a point. This and the other point will give the impression of "bear's ears". Fry, then transfer to a casserole, add mushroom stock and simmer in the oven for 15 minutes.